Fall is Nature’s prime time for growing a shiitake mushroom kit to build the body’s immune season before winter. Fully guaranteed, Shiitake Tree in a Tray from Lost Creek Mushroom Farm grows shiitakes every two months for years. 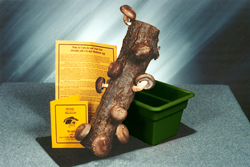 14" Shiitake Tree in a Tray Kit $49.95, 2 for $89.95 shipped to the same address. Mushroom growing kits over 9" are fully guaranteed. Fall is Nature’s prime time for growing shiitake mushrooms to build the body’s immune season before winter. Fully guaranteed, Shiitake Tree in a Tray Kit from Lost Creek Mushroom Farm grows shiitakes every two months for years. Sandra and her husband Doug Williams have been growing shiitakes on hardwood logs for 25 years. (See how they do it here.) They cut logs in winter and inject them with spawn, the seed material. The spawn grows through the wood until fall. Cooler temperatures and rain make the mushrooms pop out and in a few days they are ready for harvesting. Grown indoors like plants, a shiitake mushroom log will produce mushrooms about every two months. Doug described how they grow: “Immerse your log in non-chlorinated ice water to get the mushrooms. Then let it ‘rest,’ soaking it in non-chlorinated water every two weeks to keep the shiitake growing inside the log until the next "fruiting." You get more every time for about 3 years. “Set them outside in shade now and they’ll grow more mushrooms, bigger and meatier. Then take them inside and they’ll fruit during the winter,” he said. Kits include a ready-to-fruit hardwood log, instructions and a recipe booklet. All mushroom log kits over 9 inches are fully guaranteed. Shiitake Mama is adamant about shipping costs: "Our log kits are priced with 'shipping included.' There's no such thing as 'free shipping.' Speaking truthfully is important to me." Lost Creek Mushroom Farm’s Shiitake Mama mushroom kit is a 10-inch log for $33.30. The Shiitake Ma & Pa Kit contains two 10-inch logs for $55.50. They can yield a harvest of shiitakes every month instead of every two months by alternating the fruiting log. Fruited together, they grow more mushrooms than a single 20-inch log. Baby ‘Shroomie is a 6-inch log for $20. It fruits the same way as the larger kits but is not guaranteed. 'Shroomie’s brother, the Big Boy kit, is a 12-inch log for $38. Granddaddy Shiitake Tree in a Tray is a 14-inch log with its own tray for soaking, fruiting and resting for $49.95. The Best Buy has two 14-inch logs in soaking trays shipped to the same address at substantial savings. Logs can be alternated for monthly harvests or fruited together for large harvests. Lost Creek Mushroom Farm donates a portion of sales to Mushrooms for Well Being Foundation: Mushrooms in Ghana Project. The project is building a laboratory to provide spawn for small-scale mushroom farmers in Ghana and West Africa.